The start of fall’s comic solicitations are now here, so here’s a look at what’s of interest from DC Comics for September 2015. A full list of solicitations is available here. *Whew*… yes, there’s a lot above, I know. The variant cover theme this month is Green Lantern’s 75th anniversary. Some of said covers even feature mock turtleneck-less pre-New 52 costumes, plus Alan Scott (the actual 75th anniversary guy), John Stewart, normal-looking Superman and Wonder Woman, etc. “DC Comics Bombshells” I gather is taking a cue from “Superman: Red Son” and giving us a Russian Supergirl? 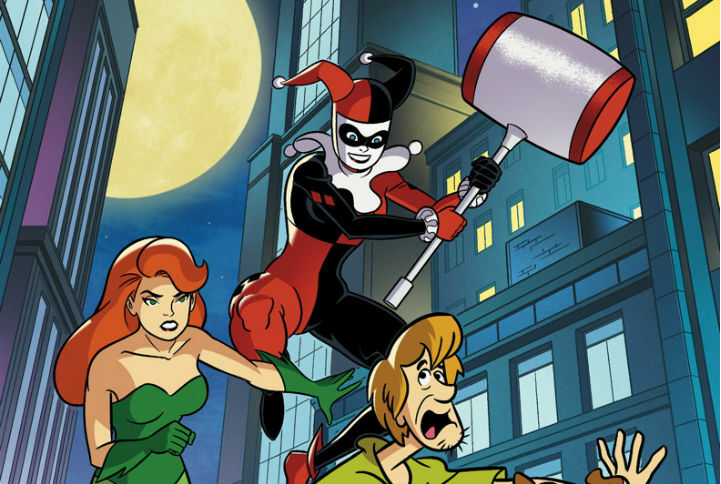 “Scooby-Doo Team-Up” sees the gang meet Harley Quinn (in her usual pre-New 52 costume) and Poison Ivy. Over in “Batman ’66,” Batman’s meeting a “1966” version of Bane. “Catwoman” is getting a 75th anniversary hardcover volume in November, just in time for the holidays. Also in time for gift-buying season, “Sensation Comics” is getting a second trade. “Convergence” is finally being released in trade form in October, with lots of choices. No omnibus edition (yet), however. At $20 a volume, plus $30 for a hardcover of the core series itself, you might be better off catching up on all of “Convergence” via your local public library, unless you’ve got $190(!) to spend. Hopefully someday, DC will release a comic reading service similar to Marvel Unlimited, which like the library would make reading such events much easier (and cheaper).